Sam "The Rifle" Etcheverry (May 20, 1930 – August 29, 2009) was a professional American and Canadian football player and head coach. Etcheverry played the quarterback position, most famously with the Montreal Alouettes of the Canadian Football League, and was named Canadian football's Most Outstanding Player in 1954. Etcheverry's jersey #92 is one of seven retired by the Alouettes. Etcheverry is a member of the Canadian Football Hall of Fame, and in 2006, was voted one of the CFL's Top 50 players (#26) of the league's modern era by Canadian sports network TSN. Etcheverry was the son of Basque sheep farmers who emigrated to New Mexico. 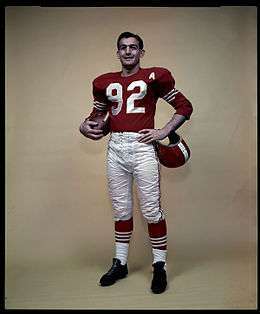 Known as "The Rifle", Etcheverry played for the University of Denver from 1949 to 1951 where he still holds most of the Pioneers' football records for passing offense. In 1952, Etcheverry joined the Montreal Alouettes of the Interprovincial Rugby Football Union (which became part of the Canadian Football League in 1958 and was renamed the Eastern Football Conference in 1960). As his team's quarterback, he was twice voted "Most Outstanding Player" of the eastern union and was named an eastern all-star six times (1953, 1954, 1955, 1956, 1957, 1960). In 1954, Etcheverry was awarded the Schenley Award (most outstanding player in the Canadian Rugby Union). Etcheverry set a single-game passing record of 586 yards in 1954 that stood for 39 years until the 1993 CFL season. He also set a season passing record in 1954 of 3,610 yards that was not only a CFL record but also eclipsed the NFL record set in the 1947 NFL season by Pro Football Hall of Famer Sammy Baugh of the Washington Redskins. He led the CFL in passing from 1954 to 1959. In 1956, he became the first professional quarterback to pass for over 4,000 yards; his record of 4,723 passing yards would stand until 1981 when it was passed by Dieter Brock and Dan Fouts. Etcheverry still holds the record for most passing yards in a Grey Cup game with 508 set in a loss to the Edmonton Eskimos in the 1955 game. A sports icon in the city of Montreal, when Etcheverry and star receiver Hal Patterson were traded to the last-place Hamilton Tiger-Cats in 1960, it caused an enormous public outcry and led to Etcheverry leaving the Canadian Football League and signing with the St. Louis Cardinals of the National Football League, playing for St. Louis during 1961–62. Etcheverry returned to Canada in 1964 as the head coach of the Quebec Rifles of the United Football League. The league folded at the end of the season and Etcheverry remained out of coaching until 1967 when he became an assistant at Loyola College in Montreal. On December 9, 1969, Etcheverry was hired to coach the Alouettes. In his first season, he led the Als to victory in the 58th Grey Cup championship game. He resigned at the end of the 1972 CFL season. His overall record is 14–24–1. In 1982 he became the general manager and president of the Montreal Concordes. Etcheverry was fired shortly before the start of the 1983 season and head coach Joe Galat replaced him as general manager. Following the demise of the Concordes, Etcheverry joined a group interested in bringing an NFL franchise to Montreal. He was one of the group's representatives at the 1988 NFL owners meeting. Etcheverry was inducted into the Canadian Football Hall of Fame in 1969 and was an inaugural inductee into the University of Denver Athletics Hall of Fame upon its formation in 1996. In November, 2006, Etcheverry was chosen 26th amongst the CFL's 50 Greatest Players in a TSN poll. Etcheverry died of cancer in Montreal on August 29, 2009. ↑ "Pringle's No. 27 retired by Als". CBC.ca. 2005-07-02. Retrieved 2007-08-02. 1 2 "TSN Top 50 CFL Players". TSN.ca. 2006-11-28. Retrieved 2007-08-02. ↑ "Etcheverry joins group seeking NFL franchise for Montreal". February 11, 1988. ↑ Goyens, Chrys (January 17, 1989). "Montreal a step closer to NFL? ".